After an especially unproductive week of lounging around my mom’s house and napping at odd hours, The Astronomer and I finally kicked our jet lag and started functioning like normal folks. 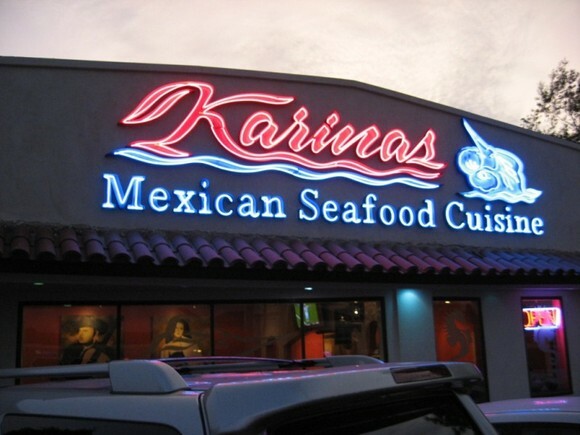 Our first meal out and about in San Diego was at Karina’s Mexican Seafood Cuisine in Chula Vista. 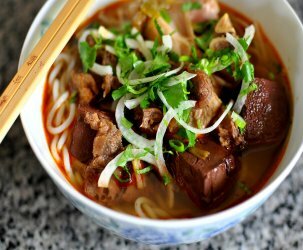 Located just nine miles from the Mexican border, the city of Chula Vista has a sizable Mexican-American population and of course, great Mexican eats. The occasion for this festive outing was Cousin Danny’s 20th birthday. The ultra-exclusive guest list included (clockwise from top left) The Gastronomer, The Astronomer, Cousin Jimmy, Cousin Danny, Cousin Phil and Phil’s main squeeze, Tannia. Cau Bao (Phil and Danny’s papa) was also present, but I’m not sure how he feels about having his mug on the Internet. The ambiance at Karina’s is lively and casual. The walls are painted a burnt orange (my favorite color) and have arty portraints hanging from them. Dining on a Friday night, we were hoping for some mariachi action, but unfortunately the band was off this particular evening. 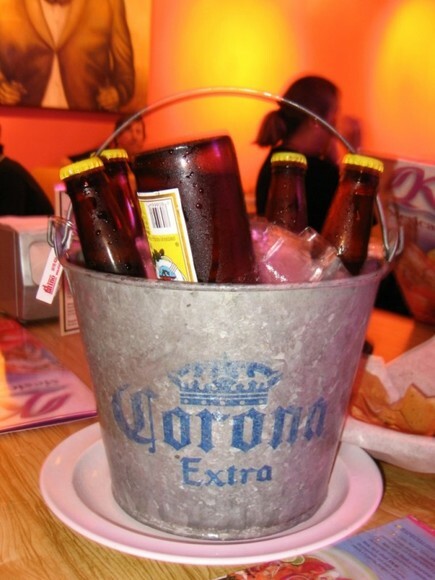 The party started with some cold cervezas served inside a bucket. Phil, Jimmy, Cau Bao and The Astronomer indulged in the libations, while I nursed a glass of water the entire evening. While perusing the menu, which is available in English and Spanish, we nibbled on warm tortilla chips and spicy salsa. 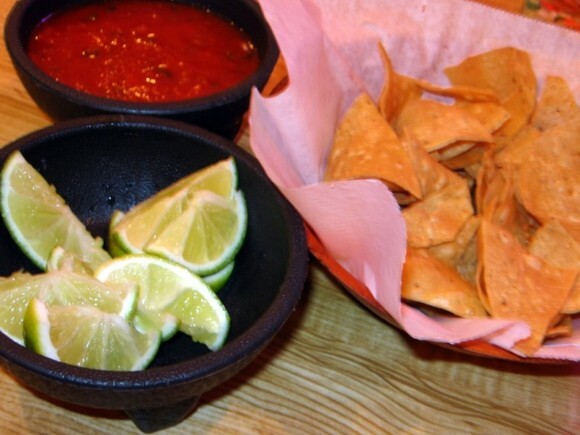 We squeezed some lime juice into the salsa for extra zing! 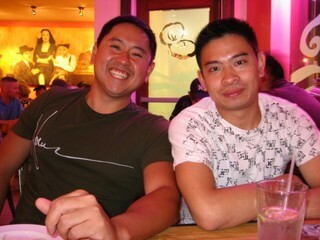 Since Karina’s is Phil and Tannia’s jam, we left the ordering up to them. The Mexican food at Karina’s is nothing like the classic taco shop fare of carne asada burritos and deep-fried taquitos I grew up eating. The flavors here are fresh, nuanced and left me feeling virtuous (yes, virtuous), rather than bogged down by grease. 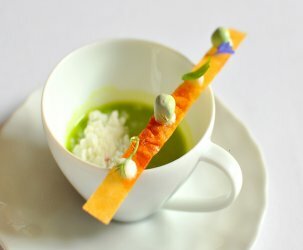 Karina’s style of keeping flavors clean and simple reminds me a lot of dining on Japanese food. Dinner was served family style, which was a perfect way to taste a bit of everything. The best dish of the evening, and perhaps the entire menu, was the Ceviche Karina’s. 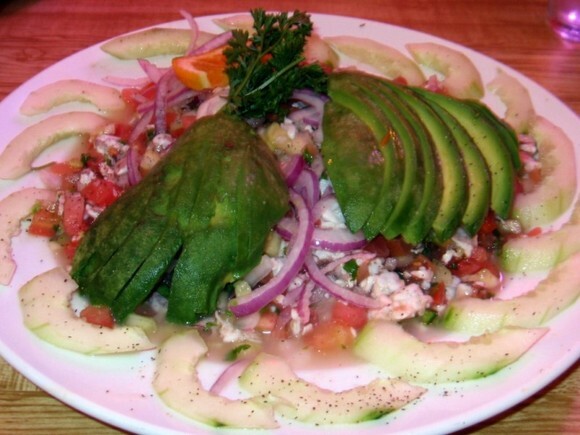 Comprised of shrimp, cilantro, avocado, onions, tomatoes and dressed with a chilie infused lime juice, this hefty starter is as lovely as can be. 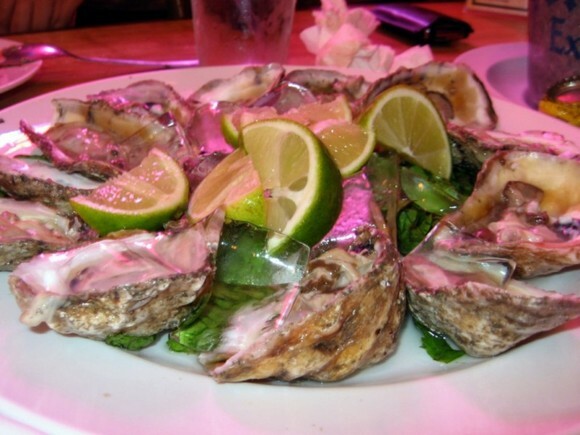 The oysters on a half shell were beautifully briny and a treat for my uncle who loves these little guys. I indulged in one with a smidgen of lime. 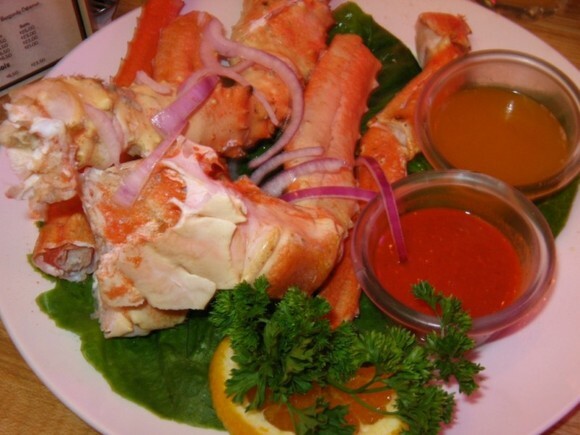 I didn’t partake in the crab legs because somtimes I can’t be bothered with clamps and dirty hands. Plus, the amount of meat yielded doesn’t warrant such hard work. 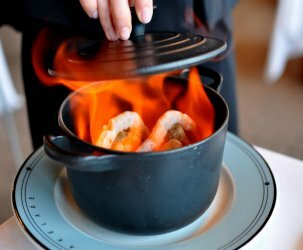 When it comes to high-quality seafood, simple preparations truly are the best for bringing out natural goodness. The easy-on-the-eyes and light-on-the-labor grilled langoustines were plump and satisfying. 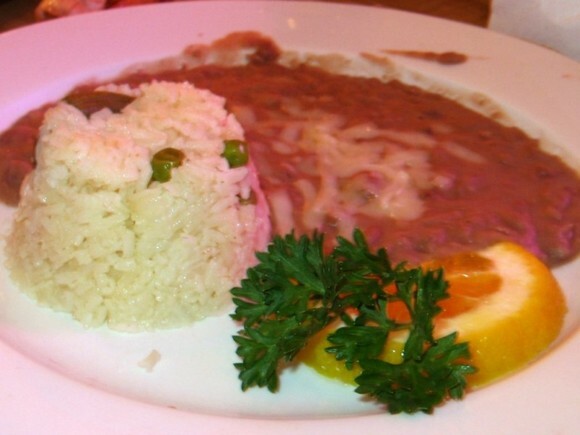 The languoustines were served with rice and beans. I was the only member of our party dying for some carbs, so I killed both with pleasure. 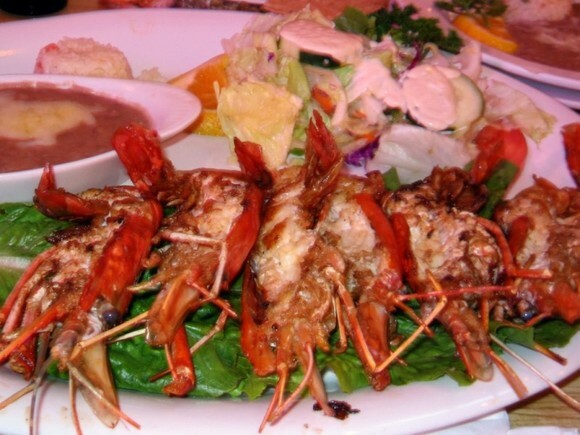 that looks like a fantastic meal, I love ceviche and the seafood looks pretty fresh. I would also be perfectly happy with just a bowl of really good rice and beans.